The most common problem with a thermostat is a miscalibration, when the unit detects incorrect temperatures for the house. Sometimes it reads the house as a few degrees hotter, sometimes a few degrees cooler. A thermostat may also do this if it’s in the wrong part of the house, such as where sun shines directly on it or it’s exposed to drafts through windows. A miscalibrated thermostat will turn a furnace on and off at the wrong times. If the thermostat registers a higher temperature, the furnace won’t turn on when you want heat—or it won’t turn on until it’s far too cold. But registering a lower temperature is also a problem, because the thermostat can run the furnace for too long, making the house stuffy and wasting energy. If you can’t seem to find a comfortable temperature when you’re adjusting the thermostat or its programming, a miscalibration may be the problem. Our technicians can see that the unit is recalibrated. A malfunctioning thermostat is one of the potential causes of a short-cycling in a furnace. This is when the furnace isn’t completing a full heating cycle, but instead shuts off early and then turns back on again a short time later. This rapid on-off operation wastes energy and places too much stress on the components of the furnace, shortening its service life. If you notice the furnace is short-cycling, have our technicians on the job ASAP. There are a number of different possible causes behind it, including a bad thermostat, and we’ll accurately diagnose the problem and fix it. Your furnace won’t turn on at all. Or it won’t stop running. These are both problems you may run into if the thermostat loses one or more of its multiple connections to the furnace and the air handler. When you can’t get your furnace to run at all, there’s a high chance it’s because the thermostat can’t communicate with it. 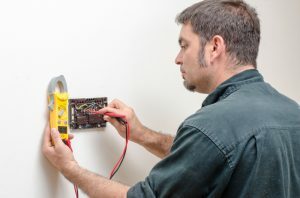 And since a separate connection is responsible for turning off the blower fan, a bad thermostat is often the cause of a fan that will not stop running. We can repair a thermostat, but in some cases it may be better and more cost-effective to have a new one put in. Please leave this installation job to professionals, since an advanced thermostat that’s mismatched to the HVAC system can end up damaging it! Bob Mims Heating & Air Conditioning has served Staten Island’s heating and A/C needs since 1955. Schedule repair service with us when you have a malfunctioning furnace.